I’m impressed by how well thought out your plan is. I jumped into things without really giving it a lot of thought beforehand. For example, I initially created a Facebook fan page because I wanted to learn how to make one and write about it – not because I thought it was something my site needed. And then surprise! It’s turned out to be very useful. I use Networked Blogs on Facebook, which I had before the fan page. This is what created the Blog tab that is automatically updated. I’ve left it alone because there are a number of people who seem to use and follow new blog posts via Networked Blogs – at least based on traffic to my site. I will continue to update Facebook and Twitter manually. Initially I automated both because of advice from other articles but found I lost out on engagement with followers and fans. Thank you so much for including me in your article. You’re welcome, Kim. But, like you, I also jumped into Twitter and Facebook a while back without much thought. As I commented on FB, I often have to stumble, bumble and fumble for a while before I can pose as an expert! I’ve likewise kept Networked Blogs activated for our Locally Grown fan page, only for the Blog/RSS tab, not the Wall. Another plus to all this is that it has prompted me to change gears with our community blog’s group Twitter account which, up till now, we’ve used to only post Tweets of our blog posts via DM… in a boring way, natch. So far now (two days and counting), it feels much better. Thanks to you and your post for whacking me upside the head on it. Griff, Kim has been teaching me for a long time and also been my WordPress expert on multiple occasions. I came to visit you because of your comment on her blog. I love it that you are working a strategy and learning from the masters… we have different masters we learn from but I am much more strategic about my social media interaction than I was in the beginning. I also had to learn that smaller is better — following large numbers cut off the conversation for me on Twitter. ON Facebook, I have favorites and building interaction on my FB page is harder than on my personal page. Thanks for stopping by, Julie. Apologies for not approving your comment sooner. It got lost midst the spam! 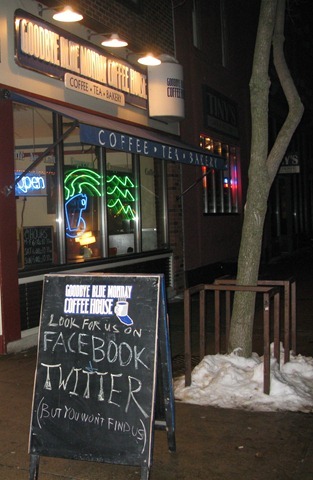 I’ve been happy with my shift in how I use Twitter and Facebook in conjunction with our community (Locally Grown Northfield) blog. I’ve yet to learn the art of fostering interaction via Twitter (replies, DM’s, etc). Stay tuned.